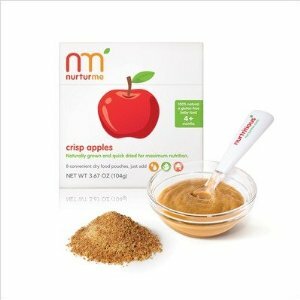 Once baby moves on to solids the best baby food is homemade, but there are time when convenience is a necessity. NurturMe All-Natural Baby Food is the first dried baby food I have ever come across, and it is organic. Naturally grown and quick dried, NurturMe baby food pouches maintain more of their nutritional value than pre-cooked foods and come in light weight, palm-sized pouches – perfect for on the go feeding. Prepare the same way you would rice cereal by adding water, breast milk or formula and stir to reach desired consistency. One pouch yields approximately 2.5 oz of prepared food. Mix + match pouches for variety, mix into yogurt, combine with grains, the options are endless! You can also sneak NurturMe fruits and veggies into toddler foods as a clever way to boost the nutritional value of older kids’ meals. Weighing less than a jar and packed in recyclable materials, each NurturMe pouch leaves a smaller carbon footprint on our planet. Nutritious. Convenient. . NurturMe is Good for me, Good for we. NurturMe comes in many flavors. We were sent [amazon_link id=”B005NH4XX0″ target=”_blank” ]NurturMe Organic Baby Food Pouches, Crunchy Carrot[/amazon_link] and Sweet Bananas. The bananas have no added sweetener and contain rice flour. The carrots contain organic maltodextrin, which does concern me as it is a highly processed starch often found in junk food. Would I buy this product? Probably not the varieties that contain the maltodextrin. I can see the convenience of dried baby food and the benefits; however, fresh is always best. « How Can I Detox My Thanksgiving Diet? Organic baby, really? If you were so interested in being eco friendly, you wouldn’t be a parent. Every human produces, on average, 27 tons of greenhouse gasses every year. You are not solving a problem… you are the problem. Easy to carry Mmmh ,I found them at Woolworth’wanna try my 1 year two months Babe Girl. Disney: Go Green and Chemical Free!